In a study and subsequent research report written by Doug Miles as the head of the AIIM (Association for Information and Image Management) Market Intelligence Division in 2011, participants were asked to rank the benefits achieved through Enterprise Social solutions on the basis of positive impact made to their businesses. Linking to a single-copy shared document reduces the number of attachments clogging up the email system. Better innovation and shorter project timescales are also high on the list, reflecting more tangible benefits as social business applications are more likely to be included in formal workflows. Of prime importance to Enterprise Businesses is storing, searching and collaborating upon knowledge records, contrasted to traditional methods of emailing attachments. Features and capabilities are just one of the criteria used to evaluate alternatives, but arguably it is not always the best. In respect to any tool sets that require people adopt and use them for changes to occur and benefits to be realized, acceptance of the tools as providing a better way of doing things is paramount. The importance of this becomes apparent when you compare and contrast how various cloud based solutions can be seamlessly integrated in work activities, are readily adopted due to their simplicity and support actual business process improvement. In this short post I will do this by focusing on the area that delivers the greatest benefits to Enterprise's as per the study undertaken by AIIM (and replicated by others since), and do a comparison between two of the leading providers in the Enterprise cloud market today, viz IBM Connections Cloud and Microsoft Office 365. Let’s examine this from the perspective of the highest-ranking benefit of Enterprise Social Software solutions, that of storing, searching and collaborating on knowledge records. Microsoft Office 365 provides numerous products to enable people to share files and documents in the cloud. Microsoft OneDrive for Business acts as a personal file store for people in the cloud. Its 1TB capacity, although appealing on the surface, is the same as that offered by other vendors. The issue with providing personal storage of this capacity is that it does little to encourage knowledge capture, sharing and collaboration and merely shifts storage from a users PC or Inbox into yet another receptacle. In being predominately featured on the Office 365 tool bar, this leads to it being one of the most often accepted and hence, used features within Microsoft Office 365 suite, which unfortunately may encourage hoarding, not sharing of knowledge. Microsoft SharePoint Online is Microsoft’s preferred product for the sharing of Enterprise documents and files in the cloud at site level (via a document library), and is yet another storage area. 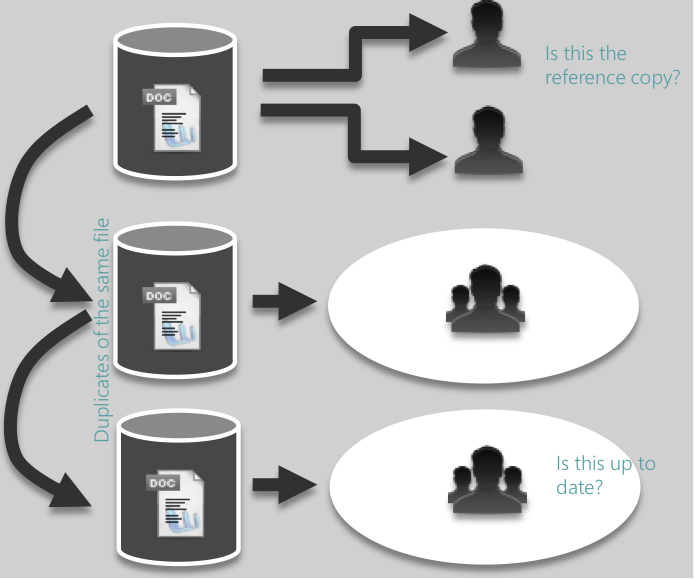 Figure 3: A single copy doesn't exist if shared with multiple team sites. With SharePoint online, users can be either readers or editors and files can be shared externally by proving an e-mail address of the guest users, with or without sign on being required for them to access. In addition, lightweight viewers (or editors) are provided for anonymous users so that access to the latest Microsoft Office editors (Excel, PowerPoint and Word) is not required. The third manner of sharing files in the Microsoft Cloud is via Yammer which provides the Social Capabilities lacking in SharePoint and One Drive for Business that Office 365 needs for a complete feature set. 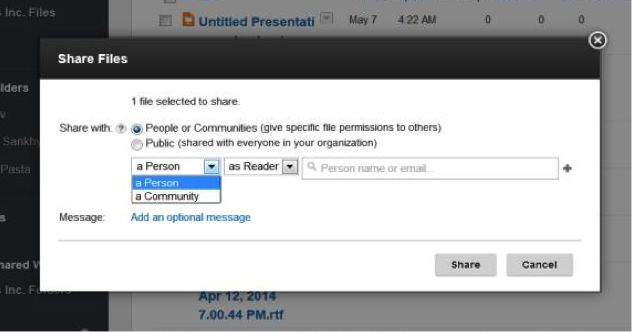 With Yammer, any and all files upload are automatically publicly accessible and are not private. 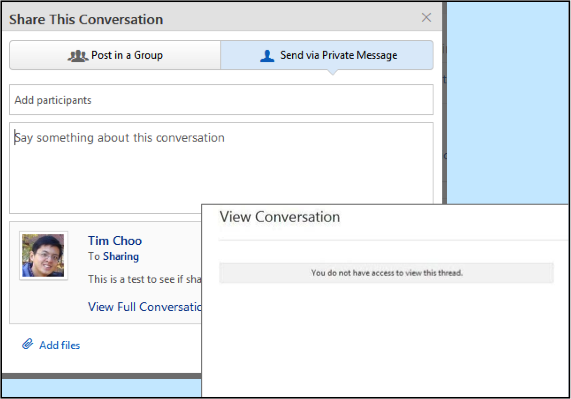 There is no way to restrict access unless you create a group in Yammer and upload files to that specific group file library which will lead to a proliferation of groups and added complexities in use. In addition any comments made on the document are not available for others to see, and the Share button whilst it will notify the recipient, does not automatically grant them access. With Microsoft’s cloud product set, the capabilities required are split across 3 separate products; One Drive for Business, SharePoint On-line and Yammer. Whilst fulfilling the requirements in providing the feature sets requested in Enterprises, the use of three separate products, each with their own considerations towards their use, makes acceptance and use difficult for people. 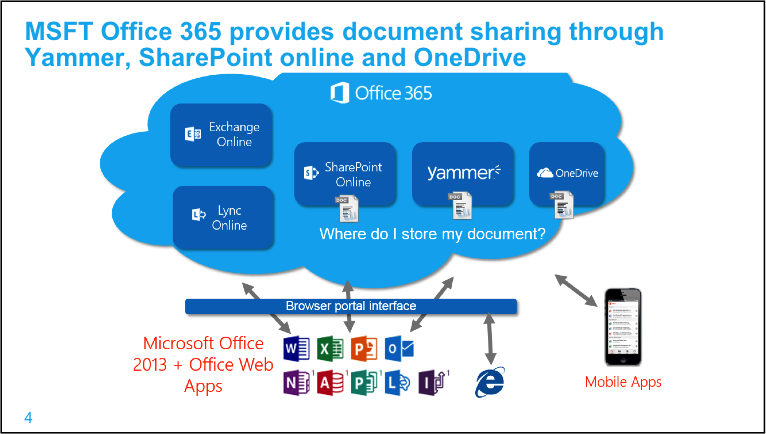 There are multiple, overlapping file repositories with Office 365: personal files go into OneDrive, team files either go into document libraries in SharePoint team sites or Yammer. Each repository has its own search mechanism that makes locating a document a complicated affair. Users waste time figuring out where a file is located. Contrast Microsoft’s approach and architectural limitations in having to use three separate, disparate products, to that of IBM in this area. In IBM Connections Cloud, a single instance of a document/file is stored. When it is uploaded to a single central location, the user decides at the time whether the knowledge record can be private, public or shared with any number of individuals (internal & external if permitted) and communities (internal & external if permitted). These permissions can be easily changed later to provide access to more or less people, communities or groups as business requirements evolve. Similarly, a user is prompted on uploading to decide on whether Editor or Read Only access is provided. As in Microsoft’s One Drive for Business up to 1TB of data can be stored in this one location. However, the major difference being that IBM provides one source for a person to go to which holds all their files, including those that have been shared with them (which don’t contribute to their file storage capacity). 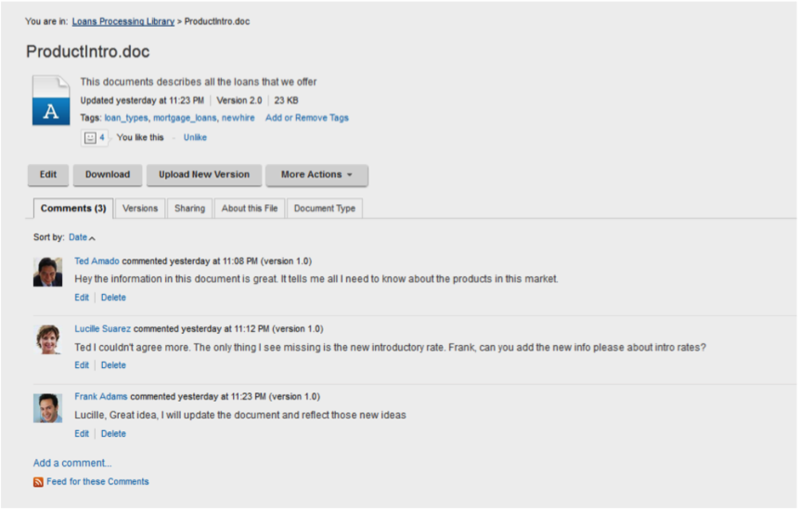 Unlike Microsoft’s product set, comments and feedback made on the knowledge record (document/file) are stored and available for viewing by everyone with access to collaborate. Also unlike in Microsoft tagging is available for each sharing scenario with search capabilities through a single search site guaranteed. How do Microsoft and IBM Cloud compare? easier to use, Microsoft Office 365 or IBM Connections Cloud? 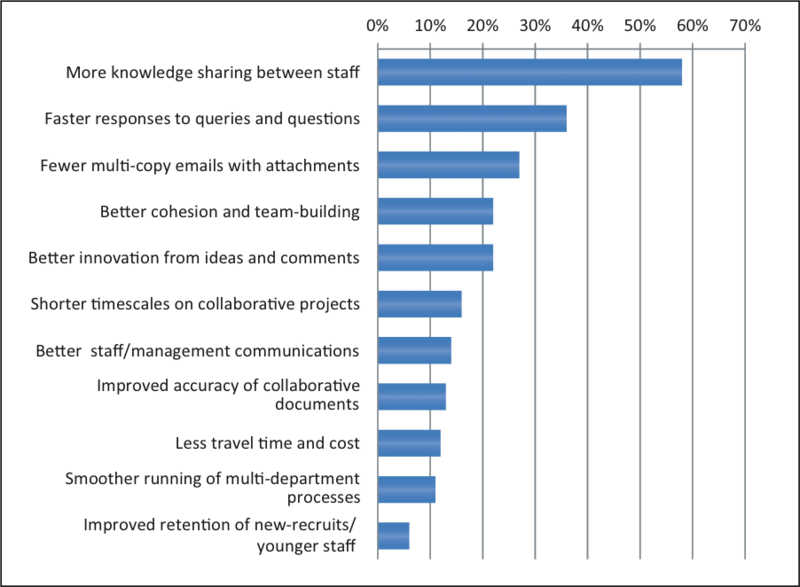 more likely to drive the change required away from eMail as a traditional method of distributing files and collaboration, towards more productive knowledge capture, management and collaboration?